Taking The Charge Podcast Episode 211: Club basketball is starting in more and more countries around Europe and we look at some of them. 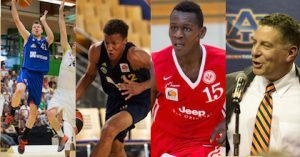 The interviews this week are with Niklas Kiel and Isaac Bonga of Fraport Skyliners and Louis Olinde of Brose Bamberg as well as Auburn University head coach Bruce Pearl. Episode 211: Germany was one of the European domestic leagues to tip off this week and we take a look at it as well as some of the other leagues that have already started.